4/22/14 - I have checked the East Orange City Websites and calendars for some mention of an Earth Day celebration, but the only thing scheduled is a library "craft project for kids" at 2:00 PM, in which Earth Day is mentioned, but with no hint at how a craft project aimed at a few children will help in a general public understanding of Earth Day and its significance. So it seems that I will be all alone in the city today, trying to get people to spend a few moments thinking about their relationship with the planet that gives them life, and a place to pursue happiness and seek liberty. I cleaned up the Clock Garden at the intersection of Evergreen Place and Central Avenue and Sanford Street, as well as the little park/garden in front of the St. Paul A.M.E. Parking lot. Problems in the Clock Garden that the city needs to address: I found several rodent burrows (inside the yellow circles) in the north west corner of the Clock Garden, near the damaged electrical box that has not been repaired since I first reported it damaged in 2013. I suspect the rodents are rats since there were food containers among the litter that I picked up from the site, but that's just a guess. North of the first problem above are two edging blocks that are out of place and which need to be reset by someone with the proper tools. I suspect that a block may need to be cut to provide a narrow spacer between the two migrating blocks, but as I had neither the tools nor the agility to do so, I left it, as is, for the city to repair. South of the green electrical box in the Clock Garden was an advertising sign from a Solar company based in Utah with offices in New Jersey. I didn't know if they had a permit to advertise in the city garden so I left it alone. In the past, signs that had received city permits were stamped by someone from City Hall with dates indicating when they could be displayed, but since there is no information on-line about current city rules and regulations concerning posting signs, I had no way to tell if this was a legitimate posting. This is a beautiful little garden that is in front of the St. Paul A.M.E. Parking lot, and which is sadly neglected by members of the churches in the area, as well as by those pedestrians who thoughtlessly drop litter and walk dogs on the grass (and who do not bag or even cover up their droppings). I did not photograph the main problem in this area, which is the brick sidewalk next to the entrance to Old Sanford Street. The bricks in that area (north east of the Stop sign in the photo) are collapsing into a little sink hole, which is a hazard for pedestrians and for those who ride tricycles like mine. No one offered to help pick up litter and no one asked for brochures, so I just did my thing, gave away no seedlings, and left both areas clean. Someone did ask me if I worked for the city, and when I said "No," I was asked why I was cleaning up the areas. "It's my civic responsibility," was my answer. "Do you get paid for doing this?" "No," I answered. But I lied. My "pay" was the discovery of these tiny blue and white flowers crawling through a crack in the concrete boundary of the garden. It was a sermon for Earth Day such as never has been heard in the St. Paul A.M.E. Church or any other church in East Orange, I dare say. The lesson was how mankind tries to confine and control nature with walls, fences, and borders; and how nature always manages to sneak through in innocent defiance of man's attempts at control. The reward is always eternal natural beauty which overshadows man-made temporary "art." 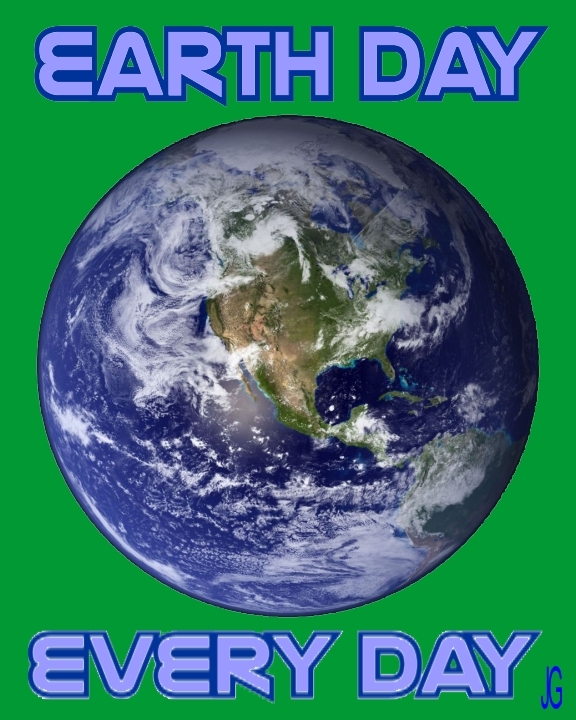 Earth Day is NOT about Global Warming or Climate Change. It's about a lesson every kitten learns from its mother: don't take a crap in the place where you live - dig a hole and cover up your mess. It's about what we learn from watching creepy crawly things in our gardens - every one of them serves a purpose in providing us with food, beauty, and oxygen. 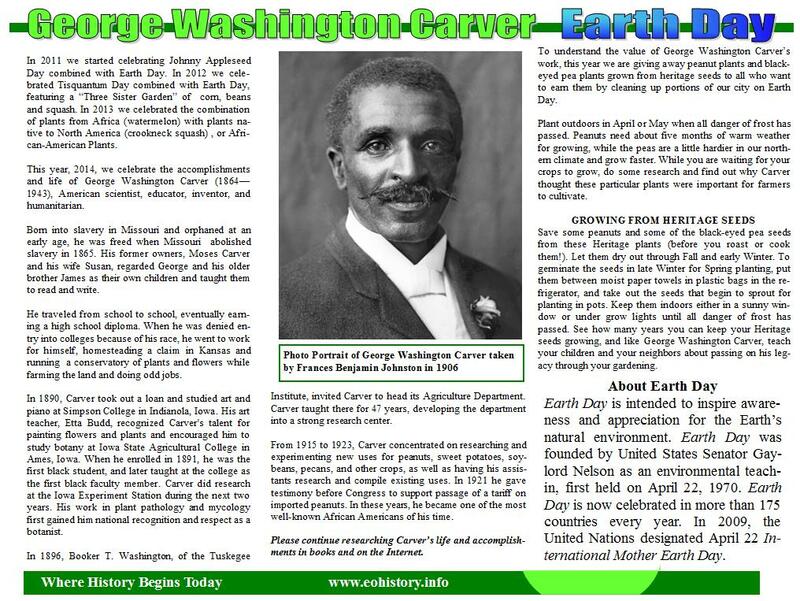 For more about what Earth Day IS, see the virtues and quotations from George Washington Carver below. This year's East Orange Earth Day celebration theme (at least from the East Orange Tea Party and The Interactive Museum of East Orange), is dedicated to George Washington Carver. Our annual brochure that I made to pass out to people on the street contains a very brief biography of Carver, but you can't condense a man's life and works into a few short paragraphs. Most people remember Carver as "The Peanut Guy" but don't know much more about him than that he had "something to do with peanuts." 1) Be clean both inside and out. 2) Neither look up to the rich nor down on the poor. 3) Lose, if need be, without squealing. 5) Always be considerate of women, children, and older people. 6) Be too brave to lie. 7) Be too generous to cheat. 8) Take your share of the world and let others take theirs. The primary idea in all of my work was to help the farmer and fill the poor man's empty dinner pail. My idea is to help the "man farthest down", this is why I have made every process just as simply as I could, to put it within his reach. We are brothers, all of us, no matter what race or color or condition; children of the same Heavenly Father. We rise together or we fall together. If I know the answer you can have it for the price of a postage stamp. The Lord charges me nothing for knowledge, and I will charge you the same. Nothing is so damaging as ignorance. I dont know, you say! What reason is there for you not knowing  you have not looked, you have not searched. Study to be approved of the Great Creator. Be master of things. Selfishness and self are at the bottom of a lot of troubles in the world. So many people fail to realize that serving God and ones fellow-men are the only worthwhile things in life. It is service that counts. 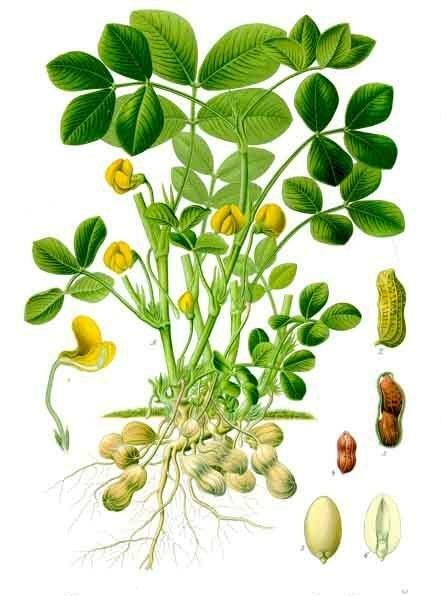 In spite of its name, the peanut is not a nut but a legume, like the black-eyed pea and soybeans. The strange way that its above ground flowers develop into the "fruit" underground is the origin of its other name, "ground nut." It is native or indigenous to South America, probably from Paraguay. You can see the life cycle in the above drawing. After pollination, the pea-like flower stalk elongates, causing it to bend until the ovary touches the ground. The stalk continues to grow downward, pushing the ovary underground where the mature fruit then develops into a legume (bean) pod that we call the peanut. For this reason, plant your seedling is a light, crumbly soil (loam) rather than packing it in a muddy, clay-type soil. Black-eyed peas are an ancient African crop that spread from central Africa. Around 1700, slaves brought it to America. 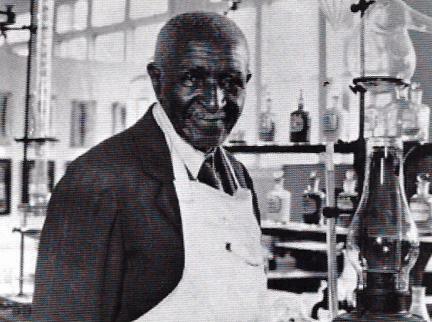 By 1903 George Washington Carver, the famous African-American agricultural chemist, was promoting black-eyed peas as excellent food for man or beast and as a plant that enriched farm soil with nitrogen. Popular U.S. folk wisdom holds that the tradition of eating black-eyed peas on New Year's Day started during the Civil War when Union troops burned Confederate farm fields but considered cowpeas, as they were called, to be livestock feed and left them alone. People in the war-torn South might have starved without the black-eyed peas to sustain them. Ever since, they have been part of the New Years Day meal for Southern folks as a symbol of gratitude and hope for a happier new year. 1. Cook bacon until crisp; set aside to drain on paper towels. 2. In a Dutch Oven, cook onion, celery and garlic in bacon drippings until tender; add broth, salt, pepper and peas. Bring to a boil and skim top if necessary. 3. Lower heat to simmer; crumble bacon and add to peas. 4. Adjust seasonings to taste, cover and simmer until peas are tender (30 minutes to 1 hour depending on how tender you like them). The seedlings we were giving away on Earth Day were grown from Heritage seeds from Heirloom Solutions. For those who don't know what a Heritage seed is, you need to know that most of the fruits and vegetables you buy in modern stores are hybrids. They either have no seeds, or their seeds will not germinate and grow. Heritage seeds are taken from non-hybrid sources. If you grow peanuts or black-eyed peas from our heritage seedlings, save and dry out the seeds (before cooking or roasting!) and almost every one of them will germinate and grow into a new plant next year, and on into the future. This is our brochure for 2014. Click on the Brochure to get a printable pdf file. 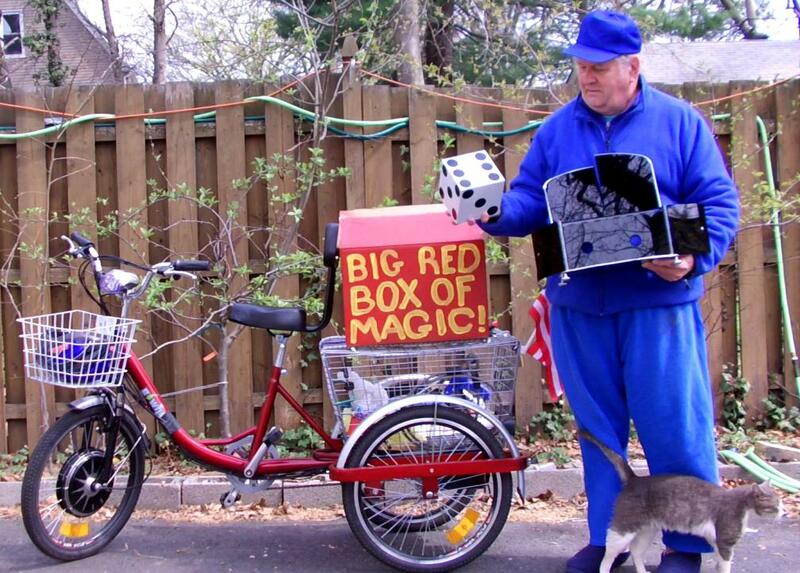 For me, Earth Day 2014 ended by giving an Earth Day after school Backyard Magic Show to neighborhood kids as an Earth Day celebration and "teach in" on what Earth Day is all about. Earlier in the morning, I video recorded a rehearsal of one of the tricks, but I took no videos or photos of the after school backyard show to respect the privacy of those who attended. I gave away the rest of my seeds and seedlings to the audience and I hope they will carry Earth Day around with them as they watch their seedlings grow.